A powerful, multi-purpose liquid for precision cleaning of glassware, filter membranes, laboratory equipment, electronics, metal parts, plastics, and other surfaces. Best used in manual, immersion, and low-pressure or low-agitation systems. Ideal for use in ultrasonic cleaners. 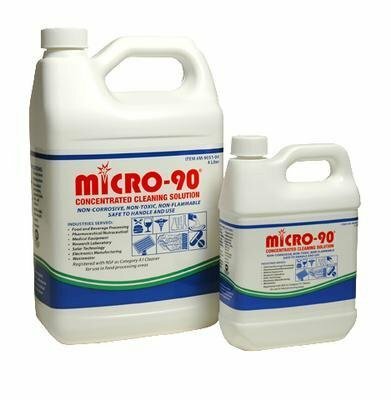 This mildly alkaline, aqueous cleaner lifts, disperses, emulsifies, sequesters, dissolves, suspends, and decomposes soils. Mixes instantly with water. Highly-concentrated â€" a one liter container of cleaner makes over 12 gallons at 2% solution. Safe-to-use. Cleaner is environmentally friendly, with no CFCs, ODCs, phosphates, or phenols. Ordering Information: Validation methods are available upon request. Cleaner is NSF-registered as an A1, general cleaner in and around food-processing areas and equipment. If you have any questions about this product by Gifts International Inc, contact us by completing and submitting the form below. If you are looking for a specif part number, please include it with your message.